The Cuisinart CSS-33 is a 3 piece magnetic grilling spice set which is essential spice set for every barbecue. With a spice grinder, a BBQ seasoning shaker, and a salt and pepper shaker is also included to have a perfect barbecue. Fill each of these containers with favorite spices and rubs and attach them to any flat metal surface with the magnetic backing on each container. And with the clear chambers, you will be able to see each of your spices and monitor the fullness levels. These containers are large enough for any spices and they close shut to block out moisture. And of course the stainless steel accented containers will look fantastic with any grill. The Cuisinart 3-Piece Magnetic Grilling Spice Set has many exciting features for users of all types. 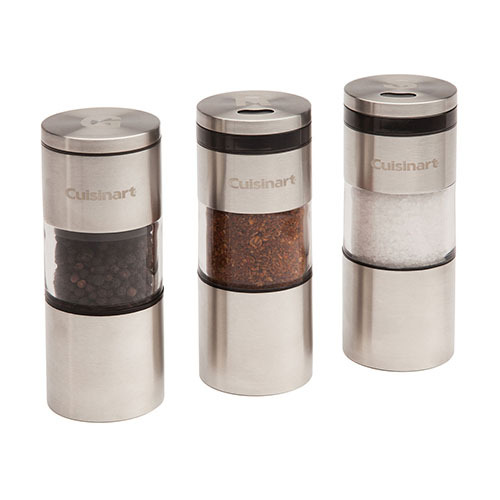 You can extend the lifetime of your Cuisinart 3-Piece Magnetic Grilling Spice Set with the purchase of a FactoryOutletStore Factory Protection Plan. 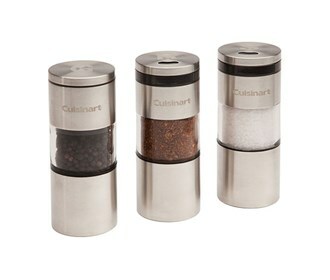 See the Cuisinart 3-Piece Magnetic Grilling Spice Set gallery images above for more product views. The Cuisinart 3-Piece Magnetic Grilling Spice Set is sold as a Brand New Unopened Item.